Boombox, a show of music-related poster, silkscreen and letterpress art, holds a closing reception at Heaven Gallery, 1550 N. Milwaukee Ave., tonight from 7pm to 11pm. Trinity Lutheran, Northminster Presbyterian and Immanuel Lutheran Churches present Godspell, by Michael Tebelak and Stephen Schwartz. Today's production will be held at 7:30pm at Trinity Lutheran Church in Evanston (3637 Golf Road). A free will offering will be taken at each performance to benefit The Night Ministry, an organization providing aid to Chicago's homeless. Livewire Theatre performs its Jeff Recommended version of Wonder of the World by David Linsday Abaire. From The Onion: "The story follows thirtysomething Cass as she embarks on a journey of self-discovery after making a shocking discovery in her husband's sweater drawer. She ends up in Niagara Falls, and the zany events that follow include encounters with bickering detectives, a suicidal alcoholic, a lonely tourboat captain, and an enormous jar of peanut butter." From metromix.com: "...this show is hilarious! Laugh out loud, things should be coming out of your nose funny." Meet actor Dan Aykroyd at Binny's Beverage Depot in the South Loop today from 3-5 p.m. and Saturday from 1-3 p.m. Aykroyd will be there to promote his new vodka Crystal Head as well his new wine. Binny's in the South Loop located at 1132 S. Jefferson. Call Binny's for more info 312-768-4400 or click here. Every March 27th, people around the globe take time to reflect on the importance of theatre in their lives. World Theatre Day helps to promote the international exchange of knowledge, culture, and art that is uniquely associated with the theatre. There are a number of venues in Chicago with live performances scheduled for today, so do yourself a favor and go catch one! Delilah's (2771 N. Lincoln Ave.) hosts two whisky related events today. First up is the 4 PM launch of Beer Hunter, Whisky Chaser, a collection of essays in tribute to legendary beer and whisky expert Michael Jackson. Books will be available for sale for $19.99. A toast to Jackson will occur at 7 PM. At 8 PM join representatives from the Maker's Mark distillery for a tasting and seminar on its bourbon. The event will include the basics of bourbon and how Maker's Mark is made. Both events are free. Ages 21+. Call 773-472-2771 for more info. Shadow Drifter Plustapes Release Show! The Shadow Drifter will be playing a show at the Abraham Washington Gallery (2908 N Lincoln Ave.) on Friday, March 27 to celebrate the release of his Plustapes release, Ol' White. The show will also feature DJ Wisconsin and Paul Yarn Bunkbeds. The gig is from 8-11 p.m., and there's a suggested donation at the door. Chicago Dance Crash brings an eclectic arsenal of dance techniques to bear, from pop (breakdance, hip-hop, martial arts) to ballet, modern, and jazz, creating a vibe that the Chicago Sun Times aptly dubbed "confrontational classic." The KTF (Keeper of the Floor) series host late-night battles between some of the top dancers in Chicago. The show starts at 10:30 pm at The Lakeshore Theater(3175 N. Broadway) and tickets are $10. 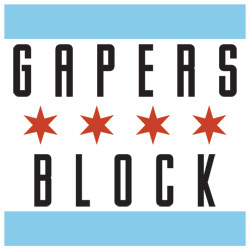 Join Gapers Block staffers and readers at Emmit's Pub, 495 N. Milwaukee, for fun conversation -- and more importantly, free beer! Radeberger Pilsner has been nice enough to sponsor our Get-Together this month, so the first 150 attendees will get drink tickets for free Radeberger beer! The party starts at 8pm and runs till 11pm; we'll have plenty of GB stickers and buttons for you, too. 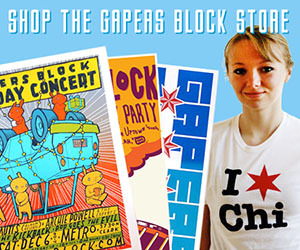 Just look for the Gapers Block banner. UPDATE: This party just keeps getting better. Eamon Daly will be performing the final lift in his Things My Beard Can Lift fundraiser -- picking up a 50-pound kid with only his beard! Get there early to watch the lift (should be around 8:15pm) and meet Daly -- perhaps challenge him to additional lifts of smaller weights for additional donations? -- throughout the evening.